Par boil valor, green chickpeas, moong sprouts. Take a pan and heat oil. Add green chillies, ginger-garlic paste and stir it for 2-3 times. 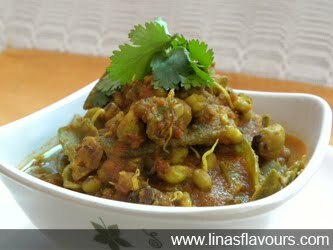 Add valor, green chickpeas, moong sprouts and saute it for 4-5 minutes. Add tomato puree, salt, red chilly powder, turmeric powder, garam masala, cumin-coriander powder and mix it well. Cook it on low flame till it is done, stirring occasionally. Garnish with coriander leaves and serve it with roti or parathas.